Blithely flinging aside the Victorian manners that kept her disapproving mother corseted, the New Woman of the 1920s puffed cigarettes, snuck gin, hiked her hemlines, danced the Charleston, and necked in roadsters. More important, she earned her own keep, controlled her own destiny, and secured liberties that modern women take for granted. Her newfound freedom heralded a radical change in American culture.Whisking us from the Alabama country club where Zelda Sayre first caught the eye of F. Scott Fitzgerald to Muncie, Indiana, where would-be flappers begged their mothers for silk stockings, to the Manhattan speakeasies where patrons partied till daybreak, historian Joshua Zeitz brings the era to exhilarating life. 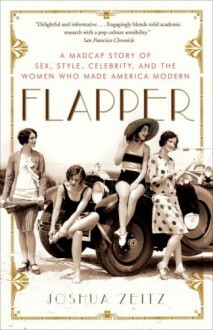 This is the story of America’s first sexual revolution, its first merchants of cool, its first celebrities, and its most sparkling advertisement for the right to pursue happiness.The men and women who made the flapper were a diverse lot. There was Coco Chanel, the French orphan who redefined the feminine form and silhouette, helping to free women from the torturous corsets and crinolines that had served as tools of social control. Three thousand miles away, Lois Long, the daughter of a Connecticut clergyman, christened herself “Lipstick” and gave New Yorker readers a thrilling entrée into Manhattan’s extravagant Jazz Age nightlife.In California, where orange groves gave way to studio lots and fairytale mansions, three of America’s first celebrities—Clara Bow, Colleen Moore, and Louise Brooks, Hollywood’s great flapper triumvirate—fired the imaginations of millions of filmgoers.Dallas-born fashion artist Gordon Conway and Utah-born cartoonist John Held crafted magazine covers that captured the electricity of the social revolution sweeping the United States.Bruce Barton and Edward Bernays, pioneers of advertising and public relations, taught big business how to harness the dreams and anxieties of a newly industrial America—and a nation of consumers was born.Towering above all were Zelda and Scott Fitzgerald, whose swift ascent and spectacular fall embodied the glamour and excess of the era that would come to an abrupt end on Black Tuesday, when the stock market collapsed and rendered the age of abundance and frivolity instantly obsolete.With its heady cocktail of storytelling and big ideas, Flapper is a dazzling look at the women who launched the first truly modern decade.From the Hardcover edition. LOVED IT! bobbed my hair after I finished!